I really wish I could garden. 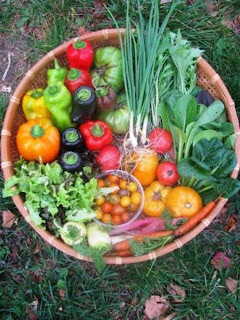 Have a large area to grow all organic fruits and vegetables. But we are renting a place right now and the only way we could garden is in tubs. Which I tried to do this last summer, but out of 2 tomato plants, 3 zucchini plants, 1 pepper plant, dill, and basil I got 1 small tomato the size of a cherry (it was not a cherry tomato variety), a pepper the same size, and lots of basil. Everything else died or got invested with bugs. Lets just say gardening is not my forte. So what is one to do if you stink big time at gardening and want great organic and seasonal fruits and veggies for a reasonable price. Well one you can go to a farmer’s market, but also there are Community Supported Agriculture or CSAs. This is local farmers in the area that allow you to become a stockholder. You pay a weekly fee (most of the ones I found in my area were about $25 a week) and you get a full to 1/2 bushel of fruits, veggies, herbs, and whatever depending on what that CSA grows. We live in southern Illinois so it is probably cheaper than some larger cities. Everything is usually picked the morning you receive it so you know its the freshest possible and not just sitting in the grocery store for a week. Since it is just my husband and I we were afraid we could not eat all those veggies. So we are going to split it with another couple that lives right next door which means we each only pay $12.50 a week. That is not bad at all! Plus the one we found if we signed up by February 1st we receive a dozen free range eggs (which we will spit also with our neighbors). A lot of the CSAs are sustainable and organic farmers. Meaning they care about the environment, soil, and grow produce with out chemical fertilizers. So until we get a house and can have a big garden (and hopefully by that time I will learn how to actually garden) the CSA is the next best thing. If you are interested in participating in one you can find local CSAs here. Every CSA is different and it will be a fun and exciting experience. I am really excited if you can’t tell! Do you participate in a CSA or farmers market? I would love to hear about it! What a great idea! I love that you two found someone to split it with 🙂 Thanks for the info!